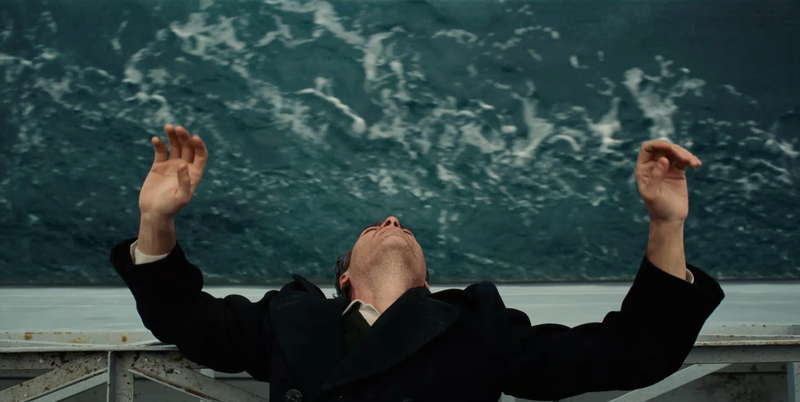 When a film director builds a body of work as layered, dense and challenging as Paul Thomas Anderson’s, each of his successive films become something of an event. Anderson’s previous film, There Will be Blood, served as something of a high-water mark, a testament to a bold artistic vision, and a rich, dark ode to a certain part of American history. 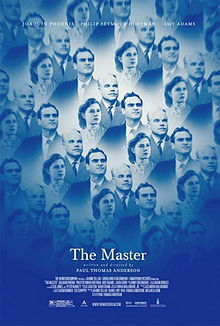 His latest film, The Master, presents another story of shadowy Americana, of self-made men and post-war confusion. And again, as with There Will Be Blood, the setting (oil drilling for the former, Scientology-like cult building for the latter) is but a foreground for an examination of odd character and unlikely relationships. There is a current running through The Master that concerns itself with the nature of man and animal. We first meet a man, Freddy Quell (played with ferocious, almost dangerous intensity by Joaquin Phoenix), who appears as something of a beast, rounding out his tour of duty in WWII, constantly drunk, sexually aggressive yet starved, floating off into a sea of unrest and uncertainty. His troubled wanderings bring him randomly to one, Lancaster Dodd (played with careful aplomb by Philip Seymour Hoffman), leader and father figure to a group known as The Cause; he announces, quite literally, that he is a man. The fulcrum of Anderson’s film is set, and we are drawn into the frontier world of the post-war 1950s, an era of lost youth and nostalgia, that seems at once both familiar and utterly alien. First and foremost though, is the boldness, and strangeness, of Phoenix’s performance; a thing that is truly marvelous to behold. Forever hunched inside his clothes, clothes that look too big and loose, yet uncomfortable, he skulks around the edges of the frame, laughing too loudly, mumbling, possessing a wild feral intensity. His Quell is a man who knows no place or purpose, only a hunger for something out of reach. Hoffman, too, rises to the occasion, delivering a performance that is charismatic, controlled and yet, capable of unruly outburst. We want to like his Lancaster Dodd, even though we know him to be a charlatan. Despite their apparent differences, there is a kinship between these men, some sense of understanding. Dodd is drawn initially by Quell’s skills at making hooch (at one point, he filters paint thinner through a baguette) and decides to allow him into his inner circle. Why? Does he see Quell as the ultimate reclamation project, proof that his cause, The Cause, can cure a broken man such as he? Perhaps Dodd sees the value in having his own personal attack dog, ready to bark and gnash at any who oppose his will. The film makes no clear attempt to confirm any of this. And Anderson, gradually retreats to his most notable hobby horse: the relationship between father and son. Here again, surges that current, the animal amongst men and society. We meet Dodd’s wife Peggy, (rather thanklessly played by Amy Adams), and some of his family, including his own son Val (Jesse Plemons), who seems at odds with his father. The middle third of the film is dedicated to this dynamic, the push and pull of the family, and Dodd’s attempts to subtly (and not so subtly) pull Quell under his spell. A great show is made of Dodd amongst his people, of his smooth movement through the waters of society, always talking, writing, commanding. Quell drinks it all in, and really, one gets the sense at times that a simple hug would have ultimately been enough to convince and sooth him. This is a film that coils around in your mind like a snake, moving languidly, almost casually, but always containing the potential for sudden danger. This quality makes it, unfortunately at times, hard to get a grasp on, sometimes distasteful to the touch. Unlike Anderson’s previous work, there lacks just a certain glimmer of heart or warmth (yes, The Master is colder than even There Will Be Blood). I believe you grow to admire it, or perhaps be disturbed by, rather than openly embrace it. Make no mistake however, this is a masterfully (sorry) made film, full of sequences and compositions that are brilliantly striking in their construction. The attention to period detail, the rigidity of life in 1950, the cold air at sea, the warmth of a house in the golden hour, the bleak, grey prison cells, all at 70mm (! ), are breathtaking. As it goes, we regard these two men as they stare, circling each other. Dodd and Quell. Man and animal. The direst of opposites and yet kindred spirits in some way. Their relationship exists in that uneasy balance, both attempting not to blink, driving into some horizon. And while Dodd, perhaps, has the good sense to eventually turn around and come back, it appears Quell would just drive, drive, drive on until he fell off the face of the earth. Good review. I still can’t put into words what I saw in that movie.